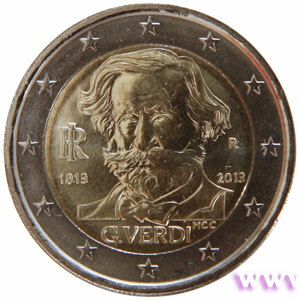 The Italian technical and artistic Committee approved on May 28, 2012 the numismatic issue for 2013, which provided, among other things, the issue of a coin commemorating the 200th Anniversary of the birth of Giuseppe Verdi, on December 24, 2012 were approved the artistic features of the coin. Giuseppe Verdi was born in Roncole in 1813, he is the most important Italian opera composer of the nineteenth century, the most celebrated of all time, Verdi set to music 33 works. In them the masterly grasp of the technical and dramatic is put at the service of the expression of intense romantic passions. One of the major works are Rigoletto (1851), The Troubadour (1853) and La Traviata (1853), in his works Verdi faced unconventional themes or even gory, with unsurpassed dramatic talent and great capacity for psychological insight. The three works cited soon reached great popularity, the parallel political events of the Risorgimento that would lead to the unification of Italy also increased the prestige of Verdi as the national musician. 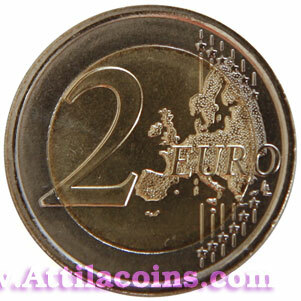 The project is the work of Maria Carmela Colaneri, graphics professional at the Italian Mint. 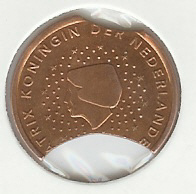 On the obverse of the coin shows the bust three-quarters left by Giuseppe Verdi in left field, RI in monogram/1813, in the right field, R/2013, in exergue, MCC / G.VERDI; around, the twelve stars of the European Union.